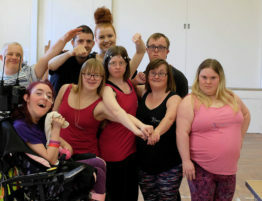 DanceSyndrome Dance Leader Becky Rich has been recognised at a national level for the contribution that she has made to the lives of people with disabilities. The Learning Disability and Autism Leaders’ List is the UK’s first national listing of people with learning disabilities and/or autism who are helping make things better for themselves and others. The Leaders’ List is a project created for its first year in 2018 by not-for-profit support provider Dimensions, in association with Learning Disability England, VODG and the Guardian newspaper. It is a collection of stories from people who have learning disabilities and/or autism who are making a difference and getting involved. Becky is a volunteer with DanceSyndrome. 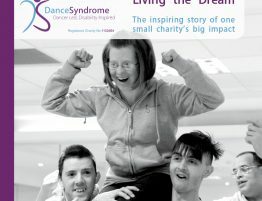 She joined the charity in 2014 and completed the unique Dance By Example leadership training, which enables people with a disability to learn how to lead their own inclusive dance workshops. Becky really enjoyed the course and it resulted in her leading two workshops of her own, independent of DanceSyndrome. 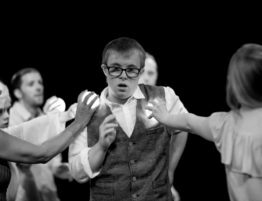 She has become a valued member of DanceSyndrome’s two performance teams, delivering inspiring contemporary dance and street dance performances to audiences across the UK. She is also a talented public speaker, going to high profile events and conferences to speak about disability rights and the need for society to be more inclusive. This has led to her being given the role of Spokesperson and Ambassador, a role which she has taken to whole-heartedly, eagerly contacting businesses and high profile individuals across the country to ask for their support. 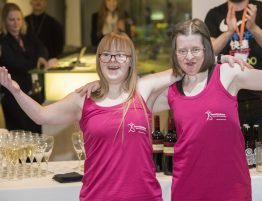 The incredible work Becky does for DanceSyndrome resulted in her being nominated for the Leaders List. She was chosen from over 600 nominations as one of the 60 people to be included in the list, one of only 15 people recognised in the category of sports, arts and entertainment. This isn’t the first time that Becky has been recognised for her inspirational voluntary work. Only a few weeks ago she was awarded The Lesley Finley Community Award from Disability Equality (NW). This award recognises the positive impact made by disabled people in Lancashire to improve the lives of other disabled people and to inspire others to make a positive impact of their own. In 2016 she was chosen as Volunteer of the Year at the Lancashire County Council Pride Awards and she also went on to become a Champion for Lancashire Volunteer Partnership, featuring in a countywide poster and advertising campaign promoting the benefits of volunteering. 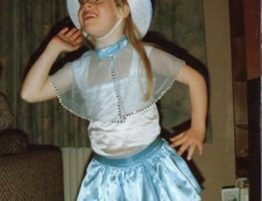 Becky hopes to keep building momentum and raising awareness of the work that DanceSyndrome does in 2019. She is even planning a new training course for DanceSyndrome, which will give other people with disabilities the skills to become public speakers and ambassadors. You can read more of Becky’s story and more about the Leaders’ List on the Dimensions website. For more information about the range of opportunities DanceSyndrome offers, please visit our Events page.